The Urukundo Dental Clinic opened in 2014 to serve our community of over 3,000 and to reach others beyond to the surrounding area. It was established to treat many low income and no income families and vulnerable children that could not afford dental care. In many cases there was no option to see qualified dentists as they were too far to travel by foot or too costly to pay for transportation. A volunteer dentist allowed us to provide free care to the poorest with others paying based on ability. Initial exams for many focus on providing antibiotics in order for extractions to be performed. 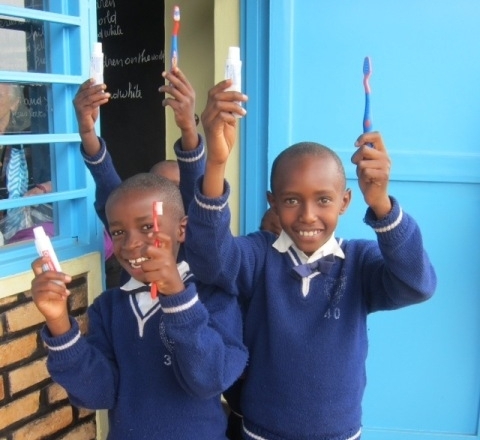 Always the emphasis is on teaching dental hygiene to all ages, especially those who have never received dental care. In 2015 Urukundo Dental partnered with the University of Rwanda College of Medicine and Health Sciences, School of Dentistry in order have a license to continue to provide dental care in the community. Our dental clinic was used as a training site for a Bachelor of Dental Therapy and Bachelor of Dental Surgery academic programs. Students came weekly for training. Low cost and no cost services were provided during this time. That partnership ended in 2016 when Urukundo Dental Clinic received its own license from the Rwandan Health Department. In August 2016, we hired a fulltime dentist and is still practicing here. Treatments currently include extractions, temporary and permanent fillings, cleaning, scaling, dental surgery and root extractions. It is recognized as an important asset to the Muhunga District.